What is kimchi and how to make it? Korean cousine is simply inconceivable without a single recipe for kimchi, a real winter specialty, and ideal for any occasion. Although it is usually made from Chinese cabbage, you can use our domestic cabbage, but also combine it with other seasonal vegetables and many spices from the kitchen. It is considered a mandatory side dish to all Korean dishes, and is mostly served on a dish, in addition to meat, fish and potatoes. Why not this winter instead of the usual sauerkraut try to make kimchi, a traditional Korean dish made from fermented vegetables? Read on about its medicinal properties and how to prepare it. Sauerkraut occupies an important place in our traditional diet for centuries. We took it from German cuisine and adopted it with great love, more because of the taste, than because of awareness of how the consumption of fermented foods is healthy for our digestive system in a whole. From Asia now comes something similar, but with the stamp of South Korea, in whose kitchen fermentation plays a very important role. In addition to rice and soy, Koreans particularly like fermented Chinese cabbage - kimchi, which is similar to our cabbage containing lactic acid bacteria, vitamins and minerals. The beneficial kimchi successfully lowers bad cholesterol levels, promotes better digestion, strengthens the immune system, protects the intestines, prevents tooth decay, cleans the skin, stimulates energy and gives us strength. It is a good source of vitamins in the winter months - is rich in calcium, phosphorus, iron, protein and vitamins A and C. In three weeks it can double the levels of vitamin B1, B2 and B3. Combined with garlic, ginger and chili powder you can get an outstanding natural remedy against flu, colds and respiratory infections, which are very much present during the winter period. Koreans eat more than a million and a half tons of fermented vegetables per year, which is an incredible figure, which speaks for itself. What is the taste of Korean cabbage? Good kimchi should have five flavours (sweet, salty, sour, spicy and bitter). This was once an exclusively domestic product, but today it can be bought in cans and can be found in most better-equipped supermarkets. There are hundreds of species of kimchi, with different combinations of vegetables ("kimchi" in Korean means vegetables), but almost each contains chili and garlic, which give it a distinctive peppery and very aromatic flavour. There are over 200 ways to prepare kimchi, depending on the region and climate, as well as from the addition of the remaining ingredients, such as radish, chili, salt, drought, a variety of seafood and the like. Vegetables which are fermented in this way are a great side dish to whole grains and healthy legumes. Ripening time is very important for kimchi. It can be eaten immediately, as kimchi salad, but for a more intense taste further patience is needed. After fermentation, keep it in the appropriate jars in the refrigerator and use it within a month, as it will otherwise deteriorate and it will be unusable. In a larger bowl, pour water and salt and stir them until they are dissolved. Pour the water into the cabbage and cut it into thick strips and sliced ​​carrots. Vegetables should be totally submerged, and you should therefore cover it and press it with something heavy. Leave it to stand for six hours or overnight. Prepare other ingredients for kimchi: leeks, wash and chop the strips, peel the ginger and chop it into cubes and remove the seeds from chilli peppers and chop it together with garlic. All of this mix in a mortar with turmeric, add a tablespoon or two of water and mix with the pestle until you get a coarse paste. It is important that all the ingredients are well mixed with spices. Drain the cabbage and carrots, but keep the water. In a large bowl, mix them together until they mix well. Add a cup of water in which you soak vegetables and press as hard as you can with a plate, on which you can put something hard (stone or weight). Add a little water from soaking if the vegetables are not completely covered. Let it stand in a dark place seven to twenty days. Vegetables must soften, absorb all spices and take the bitter-sour taste. 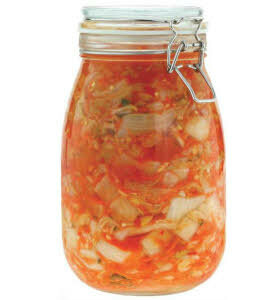 After that kimchi is moved in a jar and poured with the brine from the pickling. Our recommendation is to be sure to try the Korean cabbage kimchi. It will strengthen the immune system, and it will do a lot in the prevention of upcoming seasonal infections and colds.